Decanting is pouring wine (or another liquid) from one container to another. Essentially, what it means is that a trustee with broad discretion with distributions of trust assets also is given some leeway for using assets from another trust to meet the obligations for a beneficiary. This is referred to as a decanting statute. Decanting a trust has actually become more common than many realize and is now a common estate planning tool. As recently as a few years ago, this was rarely used; in fact, many outside legal circles had never even heard of decanting. Now, though, it’s become an option for those who live in states with weaker protections against creditors or those that have higher income tax laws. 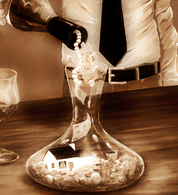 Decanting powers can be used for, among other things, changing the termination dates of a trust, creating a special needs trust, editing or adjusting administrative provisions (including successor trustee changes, creating the powers to remove a trustee or naming a trust protector) or to assist in tax planning efforts, which could include making a trust a grantor trust or changing a Crummey power. It really is all about making changes in order to better meet the needs of a client. Ohio is one of around 20 states that have these statutes that allow this option. Families often use irrevocable trusts to pass wealth to their children and others because the trusts carry certain tax advantages. While there are other types of trusts that are easier to change, they typically don’t offer the same protection from taxes. An interesting side note: New Orleans Saints owner Tom Benson is about to put his own irrevocable trusts to the decanting test as he goes about the business of removing his daughter and grandchildren from at least one irrevocable trust. The interest comes in one fact that isn’t likely to change anytime soon: Trustees can’t change a beneficiary’s already-vested interests in a trust. You can be sure estate planning attorneys around the nation are closely monitoring this. In the past, the act of changing an irrevocable trust involved a lengthy and usually costly trip to court, not to mention the publicity that may accompany such proceedings (perfect example: Tom Benson). Decanting, however, has made it so that there exists a way minus the cost and publicity. It’s important these transfers be made according to the law and they must have a strong foundation along with a provision allowing it to be moved. If not, the client should include a provision addressing that aspect. Just because the trust has been moved, there still could be statutes that will continue to tax that trust, especially if the residency of the original granter has not changed. Federal tax questions, such as the implications for gift and income taxes and generation-skipping transfer taxes, also remain unresolved. For some, decanting is a must-have. For others, there could be other solutions. To learn more about your options, contact our team of estate planning attorneys today.